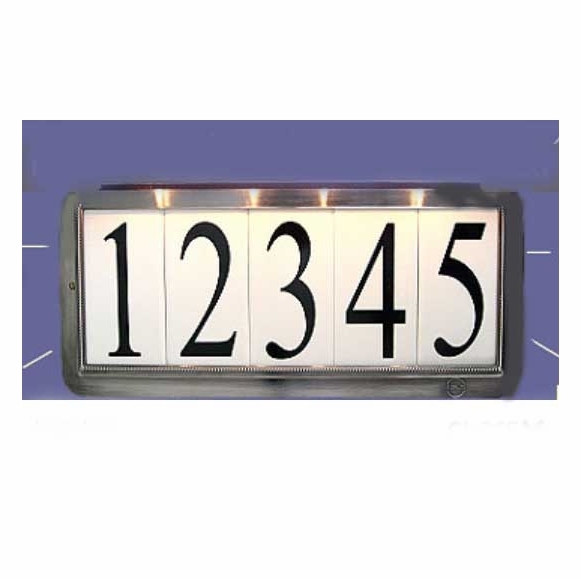 Solar Illuminated House Number Sign with Lawn Post - - personalized solar address plaque holds up to five individual numbers or letters. Includes aluminum lawn post for mounting anywhere in your yard. Made in the USA. Five frame finishes: pewter plate, bronze plate, gray powder-coat paint, white powder-coat paint, or black powder-coat paint. Yard post measures 22" above grade. White frame sign comes with a white post. All other frames come with a black post. Frame dimensions: 13.75"W x 7.4"H.
See Related Products for a wall-mount version of this solar address plaque. Well made and very easy to install. Delivered on time.